It’s that time of year again. That magical time of year when obnoxious fundamentalists do battle with government, business and society in order to secure their own vision of what Christmas should be. It’s a time for unnecessary spending and conspicuous consumption. It’s a time for awkward dinner conversation with extended family. But most of all, it’s the biggest opportunity of the year to extend your childhood without penalty. Like everyone else, I have a charmed, nostalgic view of Christmas. To me, Christmas is linked to my childhood Christmases in a working-class neighborhood in New Jersey. It makes me think of wet snow, sleepless Xmas Eves, shiny red race cars, piles of crumpled gift wrap, turkey with all the trimmings and lots of noise, arguing and even tears. For some years, I strove to recapture those Christmases. We all do. But I gave up about 8 years ago. Folks say it’s because I don’t have any kids. But that’s not it. I’ve just become jaded and weary. Christmas has devolved from nostalgia to commercialism to a carefully crafted national economic strategy. Try as I may, I can’t get past the fact that Christmas has passed. The American Christmas tradition (what is left of it) no longer appeals to me. At all. I think the Festivus is a great idea. I’m also down with those druid dudes freezing their asses off at Stonehenge on Winter Solstice. They really walk the walk of Holiday spirit. Beats the hell out of mall shopping, plastic Santas and Doritos n' Cheez Wiz, don't you think? In Germany and central Europe, St. Nicholas – the jolly sainted man who delivers presents to all the good boys and girls – is accompanied everywhere by his doppelganger, named Krampus or Knecht Ruprecht. Krampus picks up where St. Nick leaves off: his job is to terrify and beat children who don’t behave. Throughout central Europe, when Christmas rolls around, the children are filled with equal parts joy and dread. St. Nick might deliver some goodies to the kinder, but Krampus may very well appear from the shadows and beat them to a bloody pulp. Now THAT’S a goddamn Christmas tradition I can get behind! It’s little wonder that central European children tend to be quiet and respectful. Here in the US, kids have nothing to fear. Hell, if they don’t get everything they want on Christmas, they simply call CPS and accuse Daddy of wrongful touching. 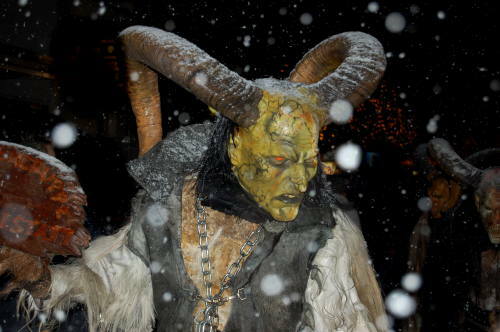 In the US, the children are the Krampus! Leave your heart, let your road be clear. You hit it on the head! American kids ARE the Krampus!! !